To be fair keyword research is just as relevant today as it has always been and there are many keyword research tools that you can choose from some free most paid. it may seem that keyword research has been lost to many as a long forgotten fad and mythical skill, but there is still good reason to make sure that the website that you create has powerful keywords so that you gain good rankings for your pages and website. When was the last time you did a search for anything that you wanted to buy now on facebook or twitter? 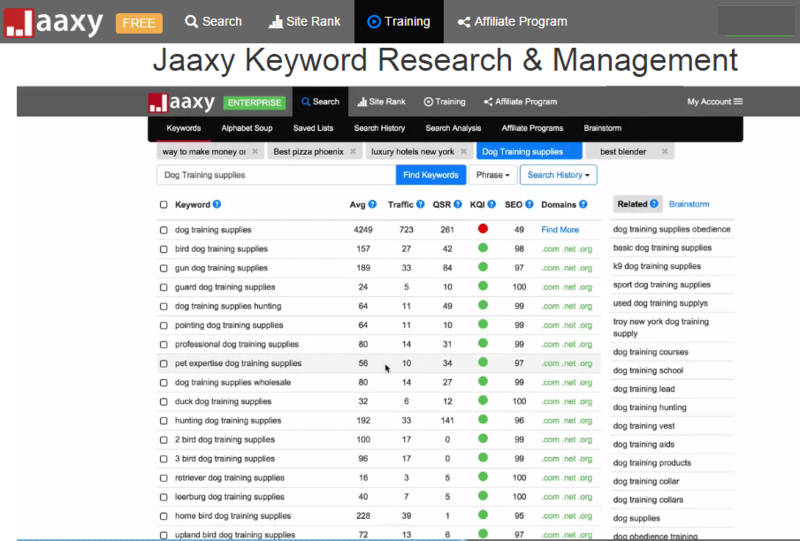 I have a love hate relationship with keyword tools as i have always found them quite clunky but luckily as part of my fabulous membership of a site whose name shall not be mentioned i came across an amazing keyword research tool called Jaaxy. Well, i say keyword research, Jaaxy can also tell you if the domain name of the keyword you have chosen is available to buy. Absolutely revolutionary if you ask me, no longer do you have to go searching for a niche then try and match up an appropiate domain name. This is not as relevant as it used to be in the olden days, but it is still good if you can get a keyword rich domain name. But Jaaxy does a lot more than just that. Related – highlights relevant keywords related to your original search terms these additional terms will give you a lot of different ideas. you can save all you lists inside of Jaaxy to help you organise your campaigns, so if you run multiple marketing campaigns using different methods of advertising you can save all your searched and used keywords in one place. with Jaaxy it is easy to see what searches you did in the past so you never lose track of those creative moments that you may have had and lost in the blink of an eye. I mean we all know what it’s like when the creative juices are flowing sometimes the ideas are coming at you so thick and fast it is hard to keep track of them. and a whole load more. It then pulls back related keywords that you have entered in brainstorm. This valuable information will allow you to multi task with different systems and see what keywords and phrases are most popular across different platform and marketplaces. This is the granddaddy of tools available on Jaaxy. You can actually see what your competition is doing, your also able to analyse your own site and see where it ranks. 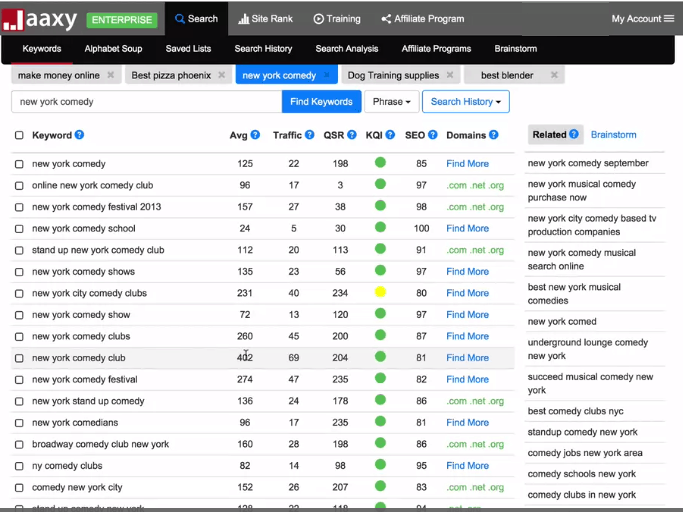 The search analysis tool also accurately tells you what websites are ranked, why their ranked where they are and also what they are doing to get ranked. Jaaxy gives you insights as to why these websites are doing well or not so well, it will show you the title meta tag, the url of the page which is ranking, the kw density, what meta kw’s are being used, how many backlinks, how many word are on the page, whether the site is on adsense and a whole lot more besides. 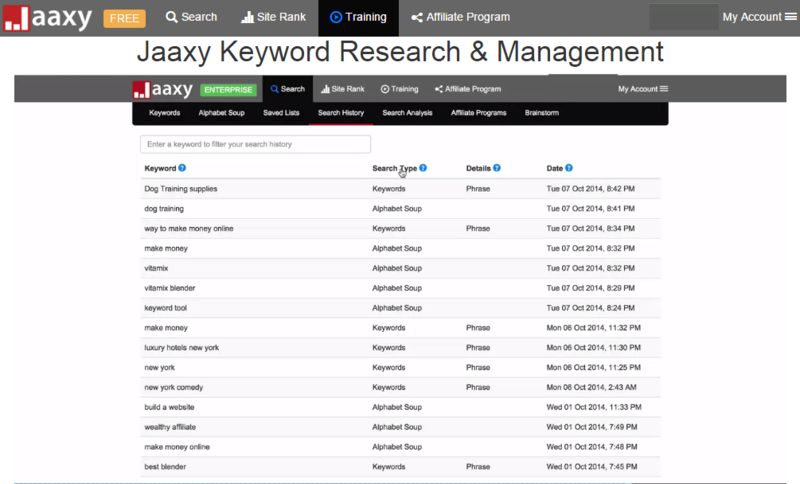 Listen Jaaxy is without a doubt one of the best keyword research tools on the market, is keyword research dead? And best of all you can try it for free today. Or if you are ready to try Jaaxy you get 33 searches for free click the link below and start saving yourself time with your keyword research.